The acrobat Miss La La caused a sensation when she performed at the Cirque Fernando in Paris. 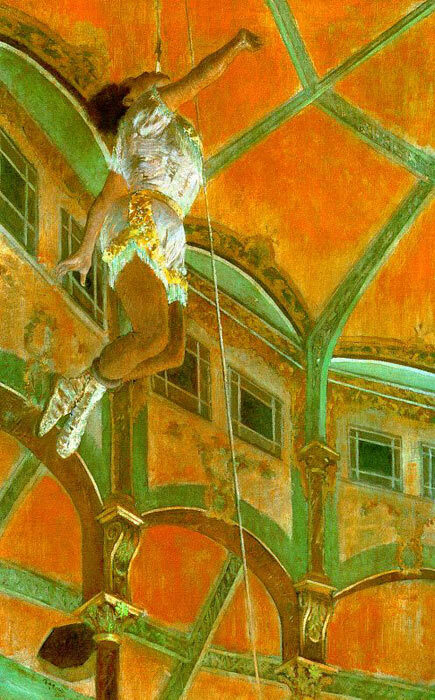 Here she is shown suspended from the rafters of the circus dome by a rope clenched between her teeth. Degas sought out such striking modern subjects, concentrating on figures in arresting poses. In January 1879 Degas made a series of drawings at the Cirque Fernando including a pastel study of Miss La La (London, Tate Gallery), which culminated in this oil painting. We view the spectacle as the audience would have done, gazing up at the daring feat taking place above. The painting Miss La La at the Cirque Fernando was exhibited at the fourth Impressionist exhibition held in April 1879. SPECIAL NOTE : The painter will make the reproduction as close to the original oil painting as possible. If you want your painting to alter from this likeness, please email us and " Miss La La at the Cirque Fernando, 1879 " will be reproduced according to your special requirements.